Ecsite, the European network of science centres and museums, was created in 1990. Ecsite is the acronym of “European Collaborative for Science, Industry and Technology Exhibitions”, the organisation’s initial name. Over the years, Ecsite’s mission broadened and its membership widened to reach more than 350 organisations today. What is Ecsite's vision and mission? Ecsite’s vision is to foster creativity and critical thinking in European society, emboldening citizens to engage with science. Its mission is to inspire and empower science centres, museums and all organisations that engage people with science, and to promote their actions. The network gathers more than 350 organisations in Europe and world-wide. Why it is interesting for ICMAB to part of it? Ecsite latests data informs that it is currently formed by 333 members: 209 of them are science centres and museum, 18 are natural history museum, 26 are research bodies or universities, 29 are private companies, 8 are festivals, 7 professional networks and 36 other organisations. All of them have in common that they are committed to inspiring people with science. Through Ecsite these organizations can collaborate on thematic strands, take part in European projects, and spread their news. For the ICMAB it is a great platform to increase our visibility to Europe and to the world, an opportunity to find partners for science outreach projects, and to learn from the experts in engaging people in science, to create better workshops and activities for our school visits, and for our neighboring society, in general. The ICMAB became full member of the Ecsite network in 2017. If you want to join this networkt too, take a look here! What is the Ecsite Annual Conference? The Ecsite Annual Conference is the most prominent meeting of science engagement professionals in Europe, bringing together 1,100+ professionals. Ecsite members attend this event at reduced rates and often take part in the conference sessions as speakers or convenors. The Ecsite Annual Conference is a great place to meet people from the organizations belonging to Ecsite, to get inspired by all their projects and activities, and to interact with them and share ideas. This last conference took place in Geneva, hosted by the Natural History Museum of Geneva in partnership with CERN, University of Geneva Scienscope, and Campus Biotech. The conference was mainly at the International Conference Center in Geneva (CICG), and a visit to CERN was also included in the conference, as well as two days of pre-conference with some activities focuses in certain topics. Highlights of the first day, 7 June 2018: the Newcomers breakfast, the Opening Event, the winners of the Mariano Gago Ecsite Awards were revealed, the opening of the Business Bistro, ten parallel sessions and the Swiss-themed Gala Dinner. Highlights of the second day, 8 June 2018: the Breakfast with the Board, particle physicist James Beacham delivered a keynote speech about "looking where no one else is looking" and about building a large hadron collider around the moon. We had 40 parallel sessions to choose from, the Business Bistro Happy Hour, and we ended the day at the Nocturne, a night at the Natural History Museum of Geneva. The 2018 Annual General Meeting also took place. Highlights of the third day,9 June 2018: Giulia and Jill Enders, author and illusrator of Gut: The Inside Story of Our Body's Most Underrated Organ, delivered the keynote speech. We had 40 parallel sessions to choose from the Closing Ceremony, in which the next edition was introduced, and the Farewell Party at the BFM former pumping station in Geneva. All in all, a great expereince, with lots of take-home messages. 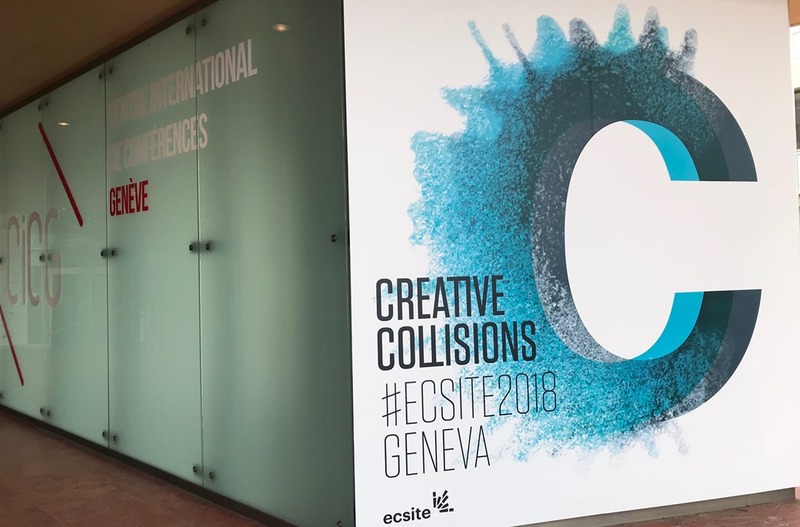 Take a look at these hundreds of photos and thousands of twitters with the hashtag #Ecsite2018 to feel the Ecsite experience! In 2019, the conference will be held in Copenhagen, Denmark, for the 30th Ecsite Conference (June 6-8, 2019), hosted by the new Experimentarium. Will you be part of it?